This spectacular 1,020 acre sporting ranch is one of the best in southwestern Colorado. Just 35 miles from the world-class ski resort of Telluride, Ed-Joe Ranch features spectacular views of the San Juan Mountains, Uncompahgre Plateau, La Sal Mountains (Utah) and Wrights Mesa own jewel--the 12,700-foot Lone Cone Mountain.Seven shares of Lone Cone Water irrigate the meadows, which give way to spectacular alpine mountain lands bordering the Uncompahgre National Forest. 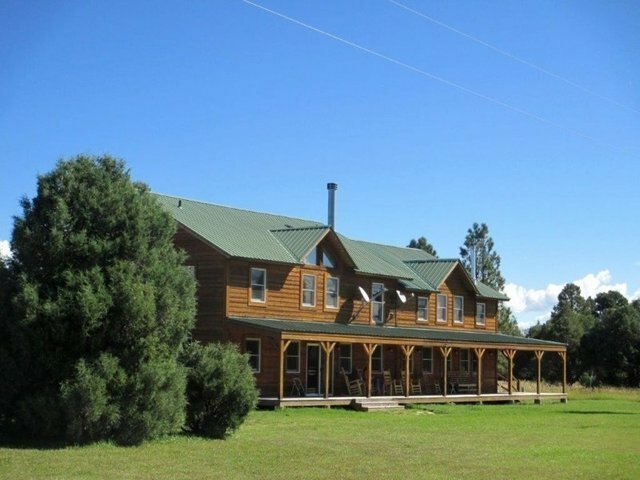 This Southwestern Colorado sporting ranch offers a 4,000 sf lodge/home with five en-suite bedrooms, a four-stall horse barn, a large shop, two strong wells and three ponds. The ranch, in GMU 70, provides great hunting for deer and elk. Additional regional recreation opportunities include excellent fly-fishing in the gold-meadow waters of the nearby San Miguel River, mountain biking the adjacent Thunder Trail system, fabulous birding opportunities, and boating in the nearby lakes. The town of Norwood is 4 miles away and has groceries, gas, medical care, restaurants and supplies.The historic town of Telluride with its legendary skiing, golf and Mountain Village Resort is in full swing both summer and winter, and is located just under an hours drive along the scenic San Miguel River. Wright's Mesa is located on the Unaweep-Tabeguache Scenic Byway, and conveniently positioned between Telluride and Gateway Resort. Moab, Utah is a beautiful 90 minute drive away.